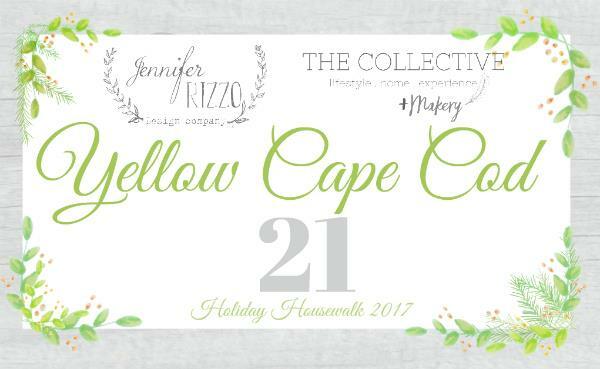 It’s time for the 7th annual Holiday Housewalk 2017! 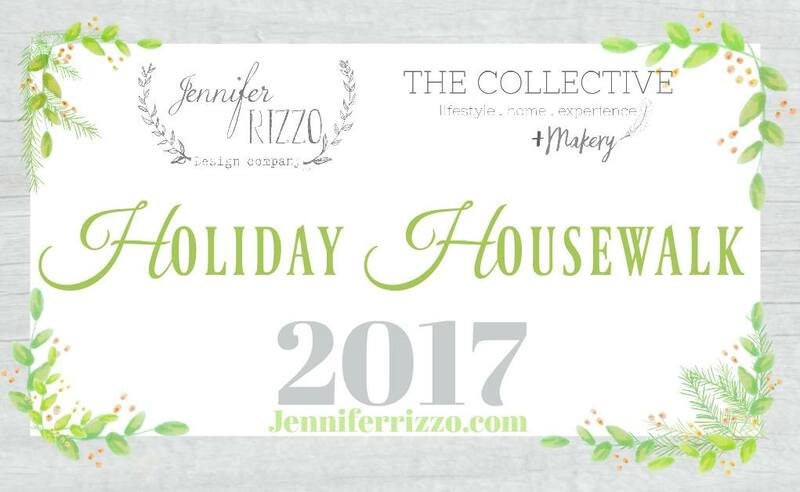 This is my second year participating, and I am honored to be a part of such a special Holiday Blog Tour hosted by my sweet friend, Jen Rizzo! 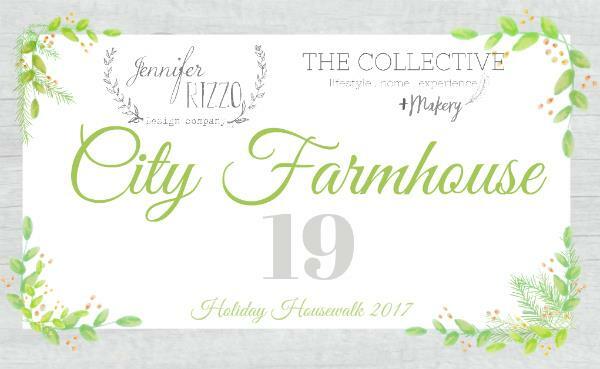 If you are on the tour, then you have just left the gorgeous home of Jen from City Farmhouse. And if you missed seeing her home, you can visit it by clicking the button below. Well, it was built in the 1970’s, so that’s pretty old, right? It was just a small ranch home sitting on 5 acres that we knew we could add onto someday, and add on we have done! Our front porch is one of my favorite additions. But we have also built a two story addition, a two car garage, and most recently, a new laundry room that you will see later in the post. This year, on my front porch, I added a bench on one side. I found it at a yard sale years ago, and it was a light blue color. I’ve spray painted it several colors over the years, and it has sat on our back porch for a while, and in my daughter’s room, and is now living on our front porch. I think it is a great little addition! I got my wreaths from Tree Classics this year. They have automatic lights on them and light up all by themselves at night, which I love! When I decorate for Christmas, I mainly focus on our family room. This is where the children will be running down to on Christmas morning to open their presents. They love when I deck out this space, and they were especially excited this year because we got a NEW TREE! In the past, we have always gotten a real tree for our family room, but this year I was really wanting a new flocked Christmas tree. 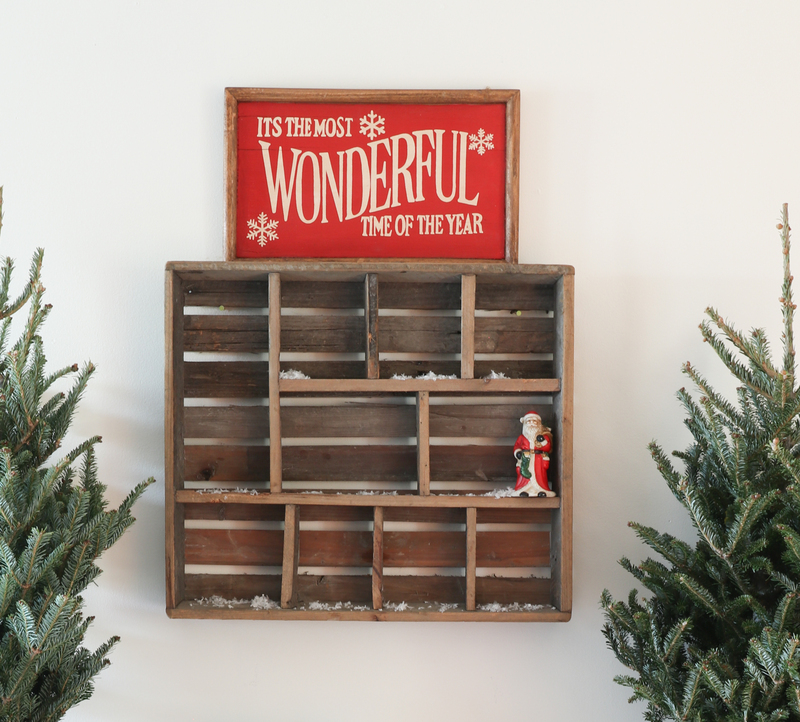 I have never had one before, and I can tell you that I am truly in love with this one from Wayfair! 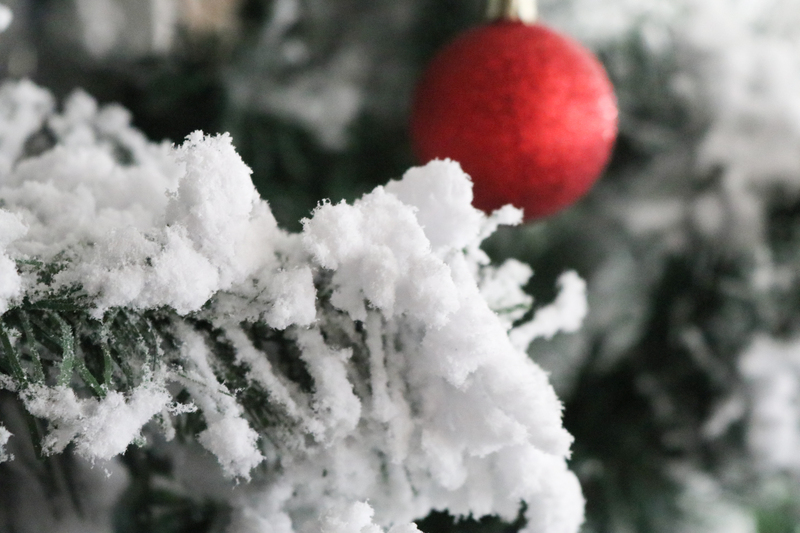 The flocking on this tree looks like real snow, and it is gorgeous! 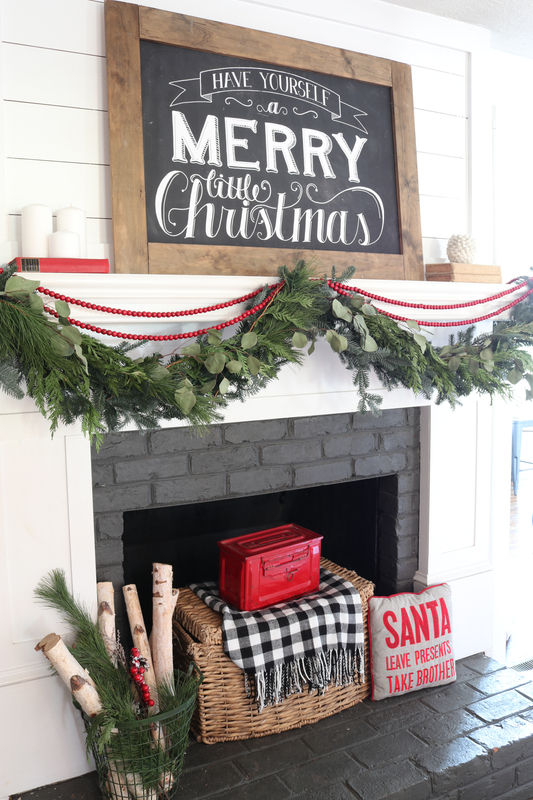 Our fireplace is also in our family room, and I love decorating it as well. 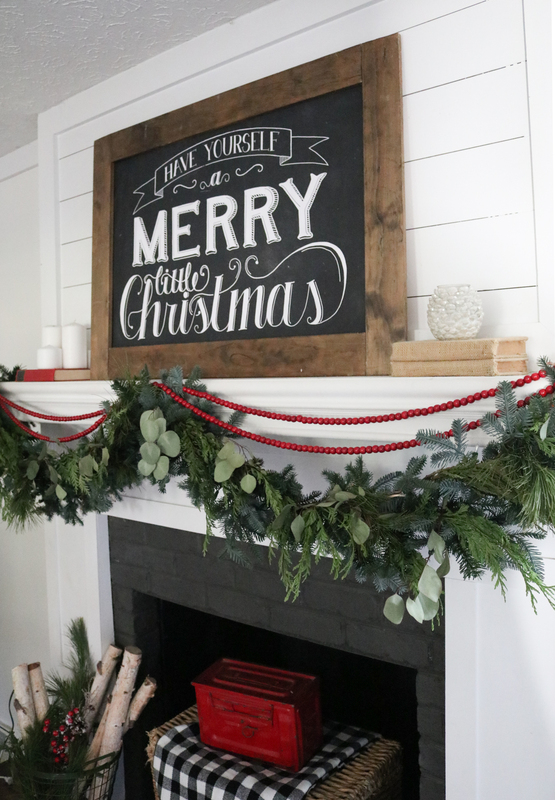 I have had this Christmas sign from Dear Lillie for several years, and I have used it in several different rooms over the years, but this year I put it above our fireplace. It sets the perfect cheerful tone for the space. I added some real greenery to my faux garland and drapped them with some red wooden beads from Hobby Lobby. 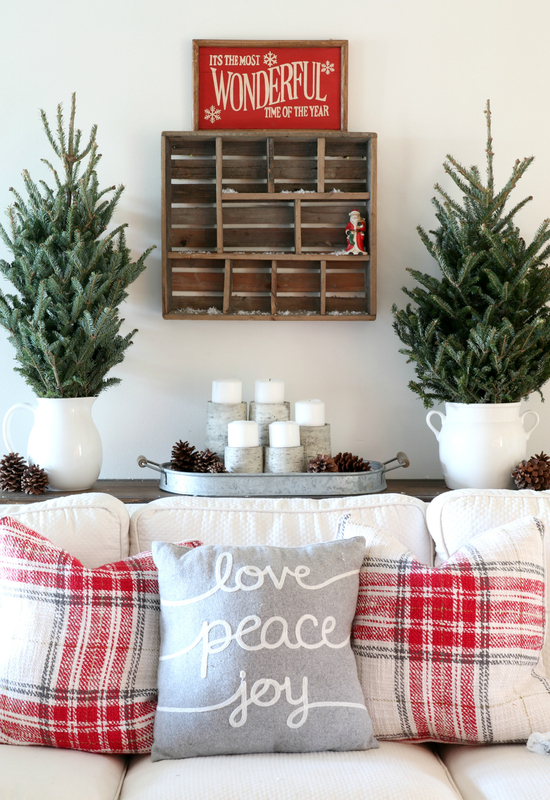 Behind our couch, I placed two real trees on the sofa table, and added some candles in a galvanized tray as well. The wooden sign is from Michaels, and the wooden display shelf was purchased at Marshall’s several years ago. 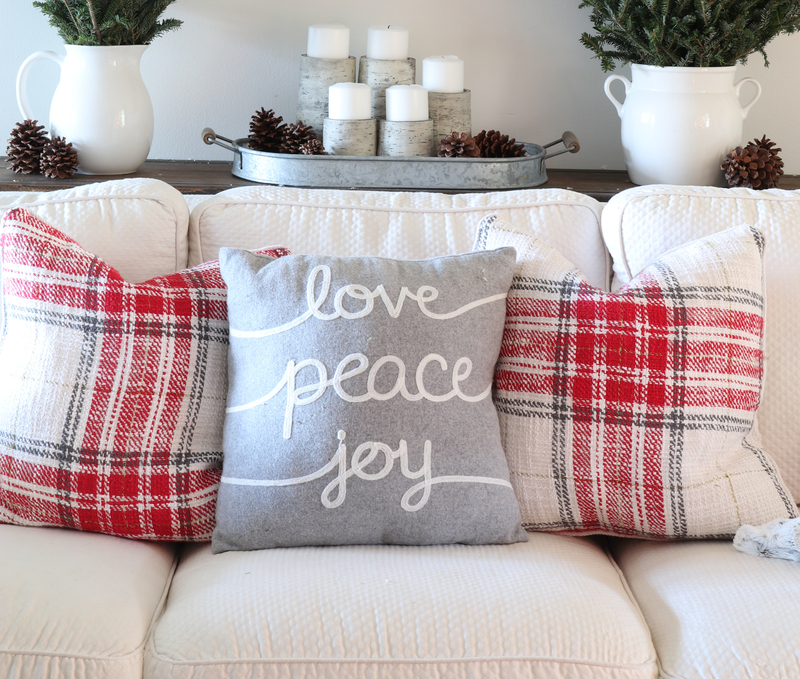 I found the Love, Peace, and Joy pillow at Kohl’s this year, and the two cute plaid pillows were TJ Maxx finds last week, so they may still have some! 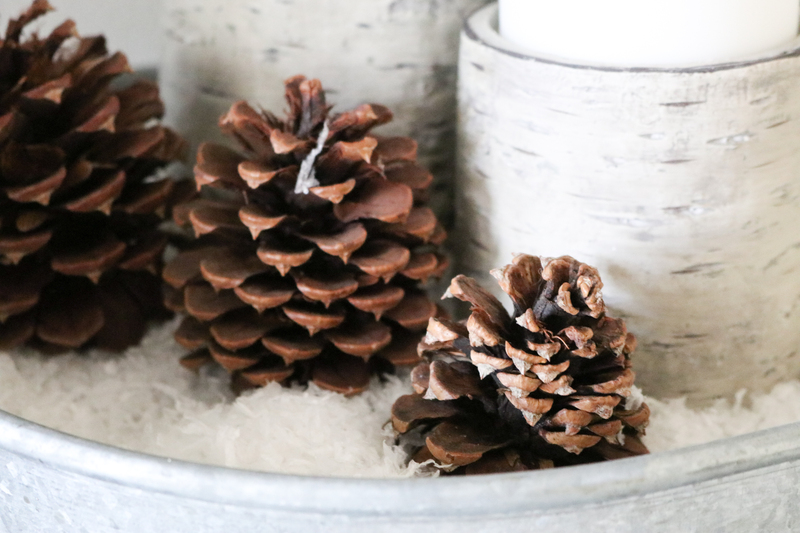 In my galvanized tray behind the couch, I placed some faux birch wood candles from Hobby Lobby, some faux snow, and some pinecones. The glow from the candles is super cozy at night! Now I know this may sound crazy, but the space I was looking forward to decorating the most this year was our new laundry room! haha! 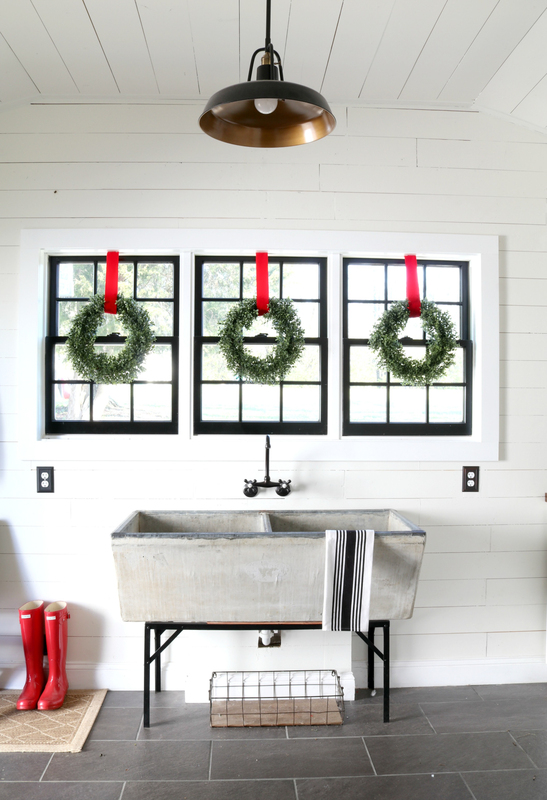 I couldn’t wait to put wreaths on the windows above our vintage concrete sink! I found these three matching faux boxwood wreaths at Marshall’s last week, so I scooped them up! I already had the red ribbon from year’s past, so I used it to hang the wreath in the windows. 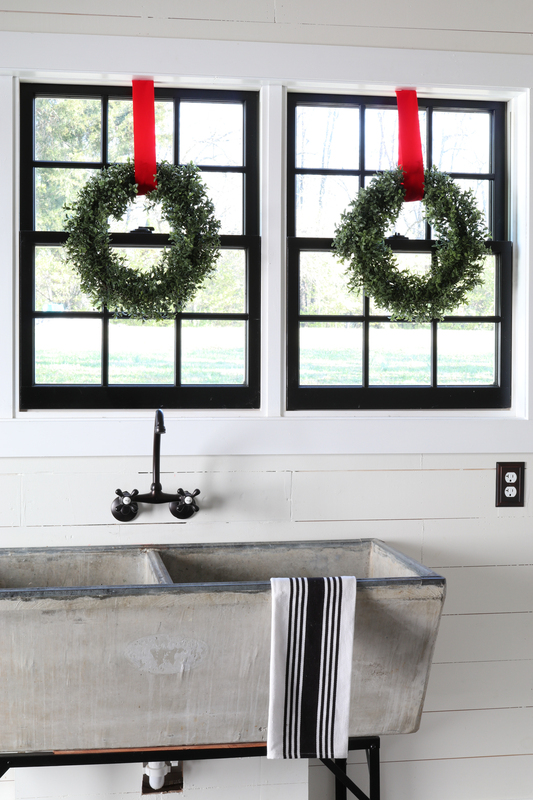 They are super simple, but the wreaths add a definite touch of Christmas to our laundry room! I also added my red hunter boots (that I took off the front porch for this photo! ha!,) and a buffalo check jacket on the coat rack for more touches of red. Over by the washer and dryer, I placed a small faux flocked tree from Michael’s and a little Christmas star to that space. And that’s it! We are ready for Christmas! This weekend we will be putting up our Family Tree that holds all of our family ornaments. That is my favorite tree, and my kids LOVE getting out their ornaments that they have made over the years or that loved ones have given to them. And I love getting out the ornaments that I made as a kid or that my loved ones gave to me when I was growing up. I even have my great grandmothers glass bead garland that has been passed down four generations. How precious these treasures are to me! Next up on the tour is Sarah from The Yellow Cape Cod! I know you will enjoy your visit there. And you can find ALL of the homes on the Holiday Housewalk this week HERE. 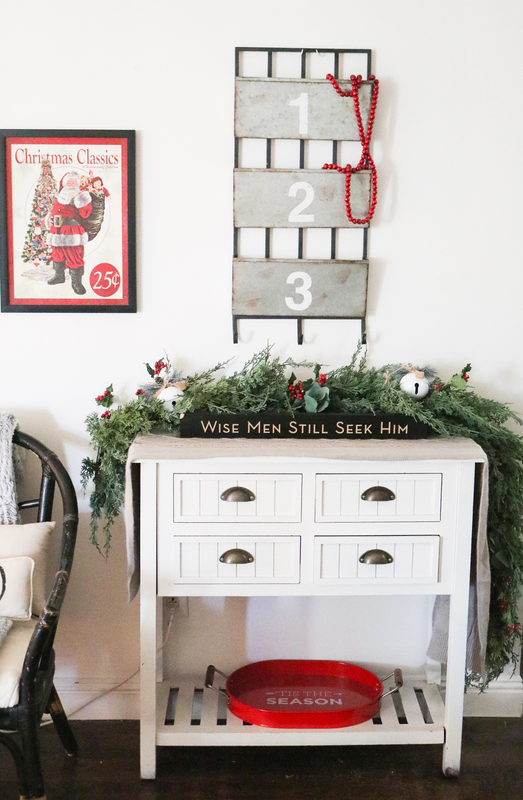 « New Wreaths and Garland for my Christmas Decor! I loved scrolling through your tour today! 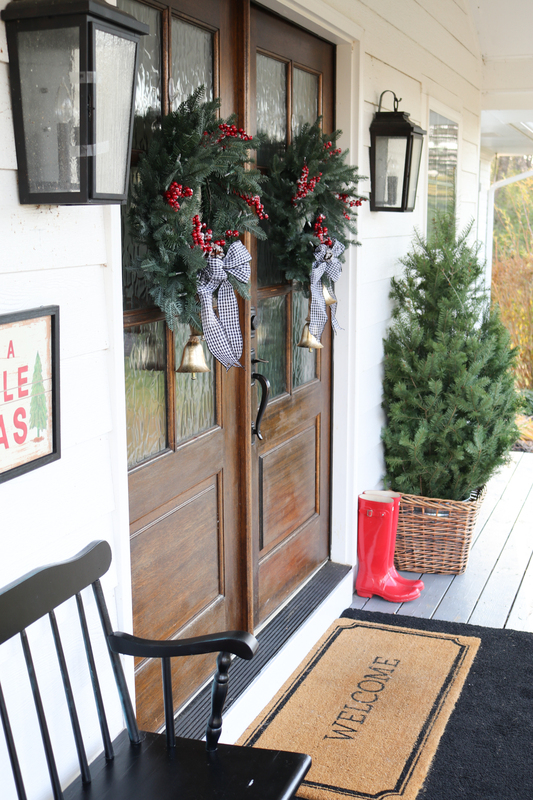 All the Christmas touches you made to the farm are perfect! Loved the wreaths on those black windows!! Beautiful, simple but yet so very festive! Traci, your home is so beautiful. 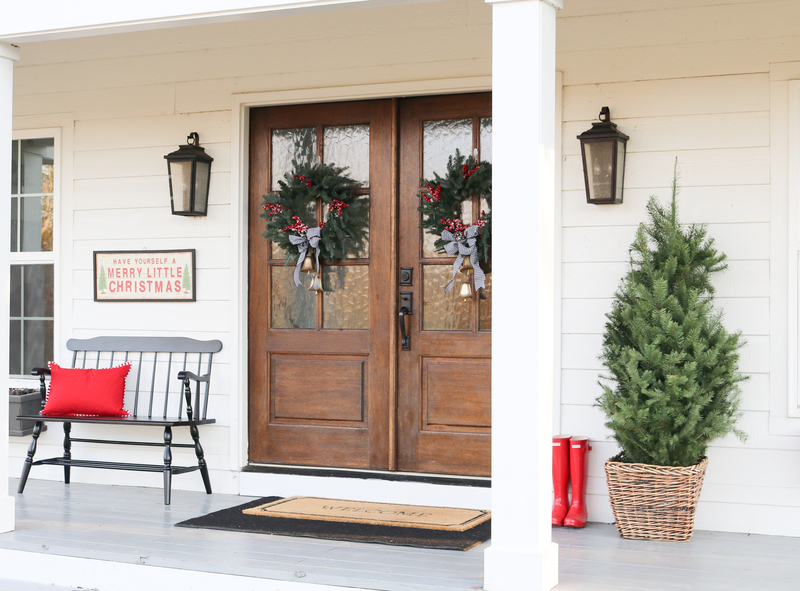 Love how you decorated your front porch to the laundry room. Every square inch I love! Love your style! Such a classic Christmas. I’m curious how well the flocked trees store, they are so pretty, but we’re not super careful packing our tree away at the end of the season, I wonder if it would get knocked off…. Your tree is absolutely gorgeous! I also purchased a flocked tree this year, however, the one I got is not as full as yours. 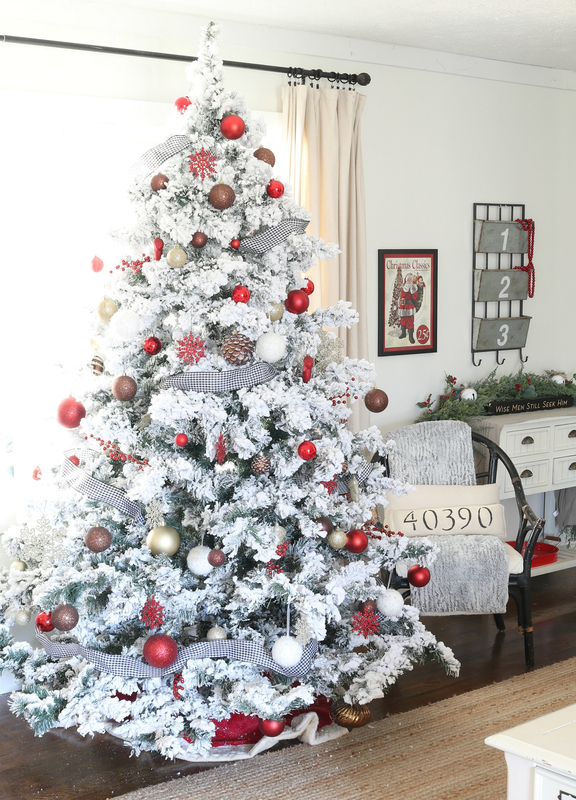 Do you know which tree this was from Wayfair?? Thinking of returning the one I purchased and getting one from Wayfair!! tracey- i have loved following your journey with the changes you have made to your home. everything looks amazing and so pretty for christmas with your sweet precious boys…and girl. enjoy the holidays! Your tree is very pretty and also the wreaths. My favorite is the laundry room. Especially the jar with closepens. It reminds me of my youth in the country. Wishing for you and yours a Blessed Christmas. 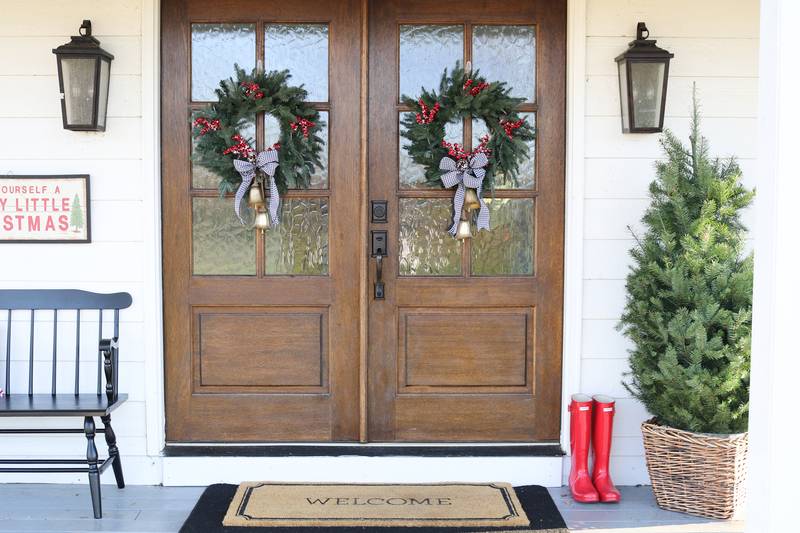 Traci…I love your home and Christmas decor! You have a great eye for design! 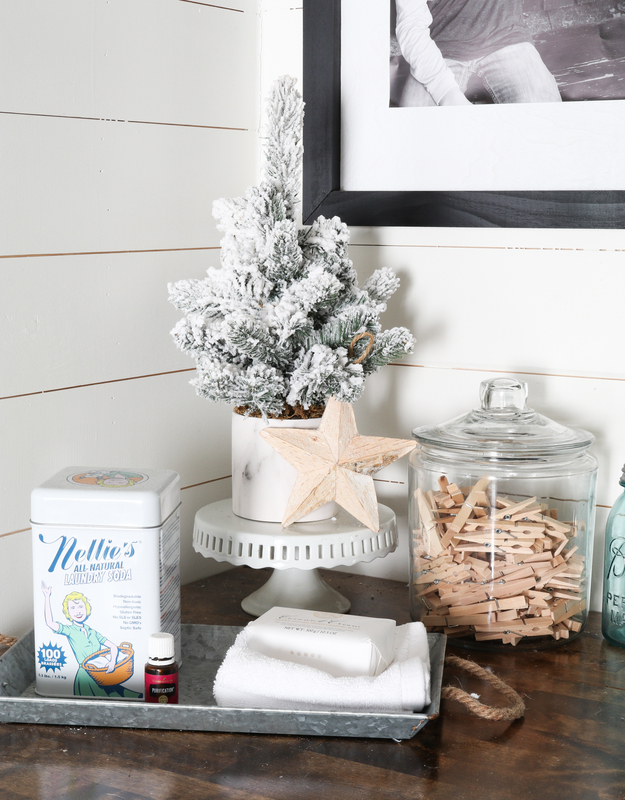 Everything is so pretty and festive, that laundry room is gorgeous! Have fun decorating with the kids this weekend! Way to go, girl! How you got this much done with your busy schedule I can only imagine. . . but you’ve done yourself proud! 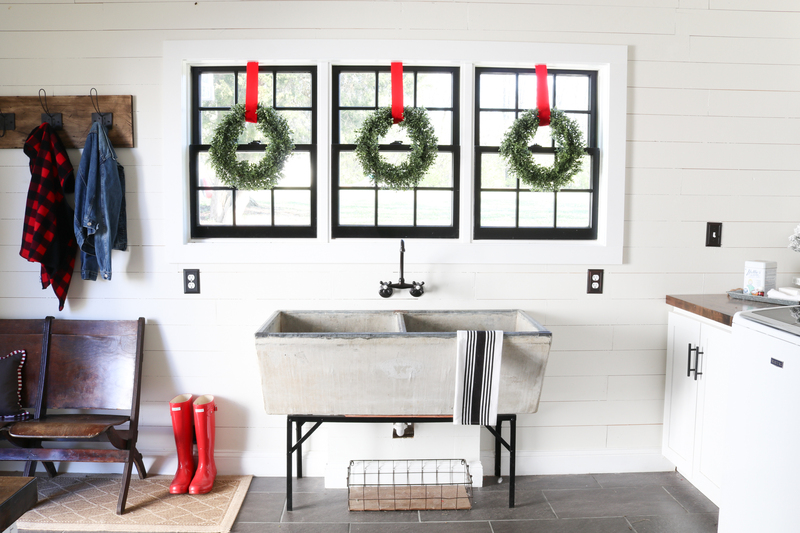 Those wreaths in the laundry room are my favorite. LOVE! Such a beautiful home, Traci! 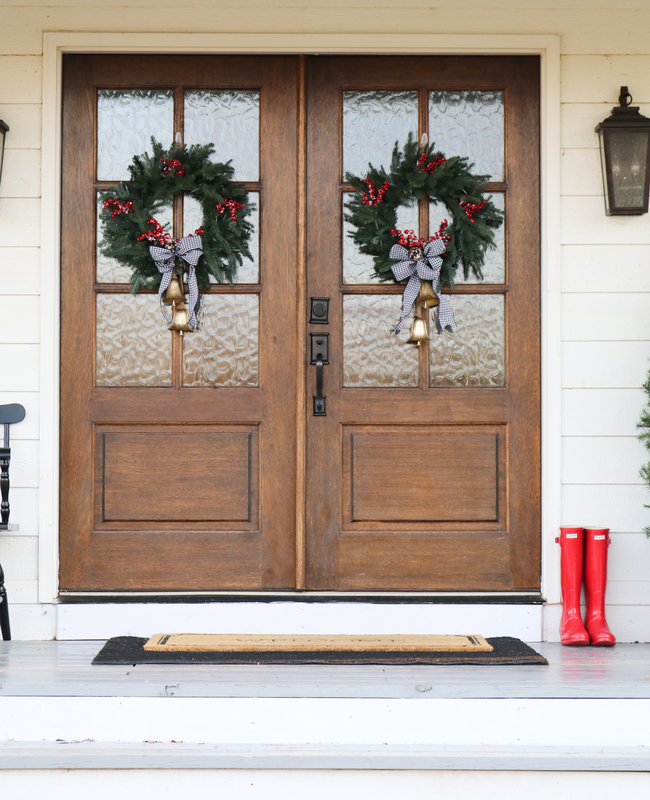 From your front porch all the way to your laundry room. I did lots of pinning! So fun to be on the tour with you today. Great decoration… Really put me into Christmas mood! Very cute ! Love it all ! Great job !! Your home is beautiful!!! But, where is your mom’s nativity? pretty pretty pretty Traci! I love it all!